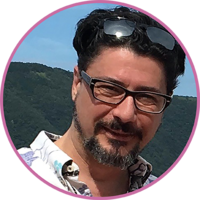 Marcos Benevides is a teacher, researcher, author, editor, and publisher. His English language teaching books have been awarded many of the top international prizes in the field, including the ESU Duke of Edinburgh Award, the British Council ELTon Award (for ''Fiction in Action: Whodunit''), and several Extensive Reading Foundations awards (for Atama-ii graded readers. His research interests include task-based learning, extensive reading, materials development, and open and distributed education. He lives in Tokyo with his family. Benevides is the founder, president, and publisher of Atama-ii Books, and co-author (with Chris Valvona) of Widgets Inc.: A task-based course in workplace English (2018). They also co-authored the original Widgets: A task-based course in practical English (2008, Pearson Longman). His other credits include co-author on Reading for Speed and Fluency 2nd Edition (2018, Compass) with Paul Nation, James Broadbridge, and Joseph Siegel, and series editor and co-author on Choose Your Own Adventure graded readers (2014, McGraw-Hill Education) with Mark Firth, Chris Valvona, and Ted O'Neill. This page was last edited on 1 March 2019, at 16:33.